I have nothing but good things to say about the NMG team. They have many people ready to communicate with you at all times..all friendly and quick to respond, and all happy to go above and beyond to make sure you are satisfied with the project. Thank you NMG for the continued good work! Their great attitude and willingness to go above and beyond. Also very fast and efficient, and deliver great quality! I'll get back to you when I can think of something. Everyone from NMG was great to work with. They were responsive and fully invested themselves in my vision for our pricing applicaiton. Their ability to understand a very complex business model and adapt their platform to my needs. If anything, it would be the time delay due to them being half way around the world, but this was never any real issue. We chose to work with NMG after interviewing/vetting ten web development companies from around the world. NMG won our business because of their deep understanding of .PHP and web design. The team is highly qualified and talented. The attention to detail is excellent. Choosing to work with NMG has been one of the best business decisions our company has made in 10+ years. Their sales team was very responsive. The client is an individual who wanted to develop a social media application for photo sharing that would allow app users to take a photograph that they have shared on Instagram and share it with the rest of world. The client already had a web-based photo sharing application which was developed by NMG Technologies and wanted to do Android and iOS mobile applications with their help this time around the same idea. The project was completed within the specified time and budget. The client is highly satisfied with NMG Technologies as they maintained a clear chain of communication and dealt fairly in terms of time and cost with the client. The client highly recommends them to their colleagues. Their responsiveness makes them stand out. The client is an online social messaging platform with the objective to provide people a way to send special messages to special people celebrating those special moments. The client approached NMG Technologies to help develop and design this web platform and also support with the up-gradation. The project was finished within the proposed time and budget. 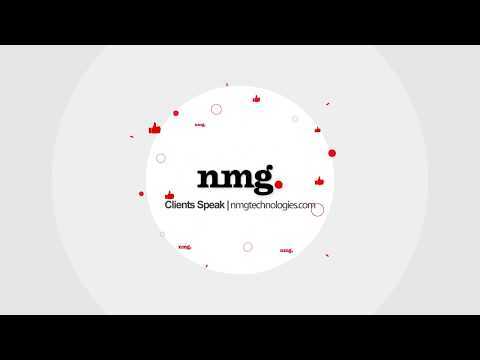 The client appreciates the efforts put in by NMG Technologies and enjoyed working with them. As per the client, the company took full ownership of the project and managed it quite well. The client highly recommends them to their friends and colleagues looking for a development partner. I like their approach and the passion they work with. The client is a non-profit organization and is an association of IT software and services that represent Indian IT companies across India and overseas. They organize a lot of national events focussing on different verticals such as engineering, BPM, HR etc and they have micro sites for each and every event with its respective information. The client approached NMG Technologies to develop these microsites for their various events. They wanted the microsites to be engaging, lively and interactive. The client has been associated with them for the past 3 years and is content with the work done by them. NMG Technologies - Outstanding Work!!! Responsiveness, Excellence and Work Ethic is why I choose them. I personally interviewed over 10 different technology companies before deciding to go with NMG. Based off my project specification document, NMG efficiently and effectively designed and programmed a captivating and interactive website. The team was always contactable and replied to any queries, design changes and requests that I had. NMG scheduled Skype calls with my team if further clarification was needed on certain design or programming aspects of the project, proving to me that excellence and work ethic is a key component of the company. I will be using NMG for future projects. The client is an individual who has a social networking website that connects the international communities, specifically international students from same countries, and the nearby residents as well. A user can connect with other international people in their particular city and also form communities with them. It allows users to connect with internationals from their own country by running a search based on a particular city. One can also create groups and events based on their interests. The client is highly satisfied with NMG Technologies because of their proactive approach in coming up with suggestions. The client appreciates their creativity, professionalism and their timeliness on completing tasks. They highly recommend NMG Technologies to work with. We are a global company with offices in US (CHICAGO, LOS ANGELES, Boulder & Las Vegas), Australia/ New Zealand (Auckalnd), UK (London) and India (New Delhi). NMG Technologies is a full-service mobile, web, ecommerce development company providing awesome services to startups, SMB's and Enterprises for the last 10 years. Our expert team of top mobile app developers and talented marketers helps you design, develop and market your app now and in the future by consistently delivering value. - We believe in infusing full power to our projects and work hard to make them grow. RGP, London & Partners, Intuit, NASSCOM, Bacardi, Nikon, Havells, Harvard Business and many more.